The Atrium, a cocktail bar on the 35th floor of the Hotel Sofitel, has spectacular views. Find classic charm in the heart of the Windsor Hotel at the The Cricketeer's Bar. 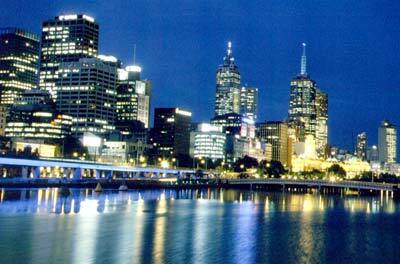 Crown Casino, Melbourne's first gambling center, has blackjack, roulette, and poker machines. There are also dozens of restaurants, retail shops, bars, and two nightclubs open until late. Look for the impressive water and lighting displays on the first floor. The casino is on the south bank of the Yarra. www.crowncasino.com.au. The Grand Hyatt's Deco Bar is a sophisticated spot. The faithful patrons of Dog's Bar are laid-back and supercool -- they'd have to be to hang out at a bar advertising itself as a canine hot spot. The George Hotel Bar is in a superb 19th-century building. Reminiscent of Hollywood opulence, Gin Palace has more than enough types of martinis to satisfy any taste. Enter from Russell Street. The Hairy Canary is one of the grooviest places in the city, but it's standing-room-only unless you get here early. Antique leather sofas and cigars characterize the classy milieu at the The Melbourne Supper Club. Stop by the Park Lounge, at the Hilton on the Park, for drinks before or after the football or cricket match at the nearby Melbourne Cricket Ground. Revolver Upstairs caters to the young. The Xchange is a popular gay bar in the busy gay district of Prahran. Diva Bar attracts mainly gay clientele. The action ranges from fast to furious at the multilevel, high-tech Metro, which has eight bars, a glass-enclosed café, and three dance floors. This nightclub is one of the hottest clubs in town for Melbourne's twentysomethings. The city's enduring night spot, Zos is a good bet for anyone under 35. Music varies from night to night. The Melbourne Concert Hall stages classy concerts. Big-name, crowd-drawing contemporary artists perform at Melbourne Park. The Melbourne Symphony Orchestra performs year-round in the 2,600-seat Melbourne Concert Hall. Open-air concerts take place December through March at the Sidney Myer Music Bowl. Cutting-edge cabaret acts are featured at 45 Downstairs. Bennetts Lane is one of the city center's jazz mainstays. The Hi-Fi Bar is a popular venue for live local and less-known international rock bands. The Night Cat hosts jazzy evening shows most nights of the week. The Palace Entertainment Complex, features alternative and hard rock headline acts, such as Nick Cave and Queens of the Stone Age. For rock and roll, punk, and grunge, head to the Prince of Wales, which also has a gay bar downstairs.